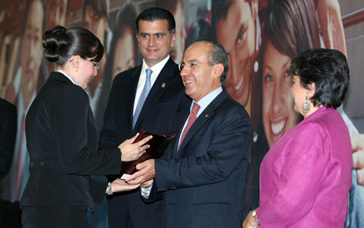 Mexico City.- President Felipe Calderón declared that, with the support and commitment of Congress, since the start of his government, the higher education budget in Mexico has risen by 40%, the highest increase in this area in many years. In particular, he said, when he led the 2010 Lázaro Cárdenas Prize Giving Ceremony, this year, the Instituto Politécnico Nacional (IPN) has a budget of over 10 billion pesos this year, a 10% increase over the amount it received last year. Accompanied by Public Education Secretary Alonso Lujambio Irazábal, and IPN Director General Yoloxóchitl Bustamante Díaz, he indicated that this has helped increased the IPN’s coverage, improve teaching quality and promote its researchers’ scientific and technological projects. “We are convinced that for Mexico to be successful, research and quality in technical education must be promoted,” he declared. At the Adolfo López Mateos Hall of the official residence, he mentioned that investment in research rose from 33 billion pesos in 2006 to over 44 billion pesos in 2010, an increase of over 32%. On the subject of the IPN, he said.